We’ve talked at length about comic book movies pre-Iron Man and the shared universe phenomenon at least once. There are a lot of relics of that passing age that get to squeak by, buried by the fallout of things like Batman and Robin or Catwoman. 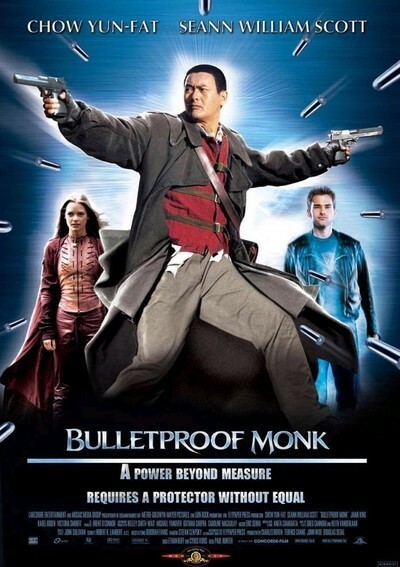 One of the very last of these, before the DC and Marvel juggernauts drowned out most independent comic adaptations, Bulletproof Monk got made. While it may be excellent fodder for an S2S sometime, it definitely warranted some attention from the Popcorn crew. Chow Yun-fat, or “the fat” as Tim calls him for some reason though we don’t have the authority to say its not a thing, stars as the titular monk who isn’t quite bulletproof. More plus one resistance to piercing damage and a dodge action. His pupils is Sean Williams Scott probably best known as Stiffler from American Pie. The fight an actual WWII nazi who’s looking for a magic scroll. This of course required him to hide behind a humanitarian organization which fights for human rights. Also, his granddaughter, who’s cleary English, serves as his second in command. Is this making sense or am I the only one that’s smelling burnt toast? Tim then talks a bit about Diversity and Comics on Youtube. It is a generally even keeled series focused on reviewing American comics. While Zack, or Richard as it were, does tend to focus on the political ideology of the artists and writers, transparent as it may be, he does well on reviewing comics and being fair to creators he doesn’t like. Weltall then talks about the two Whitehouse attack movies made and released near simultaneously. Olympus Has Fallen & White House Down. Both are ostentatious action fils with over the top people. Both only work because all of the regular people come down with a bad case of mercury poisoning. But at least Whitehouse Down has Jamie Foxx, playing an Obama analogue, firing a chrome plated rocket while doing donuts on the Whitehouse lawn from the sunroof of the Presidential limo. Liked it? Take a second to support Weltall on Patreon!